Well, this was WAS. Oh my gosh, they were so perfectly delicious. See this entire pan? They were all gone by bedtime. They were adored by all. Melt 6 Tbsp. butter in a small saucepan. Add milk and heat until lukewarm. Pour into a large bowl, add yeast mixture, remaining 2 Tbsp. sugar, bread flour, and salt, and stir with a wooden spoon until well combined. Stir in 3/4 cup all-poupose flour, then, if necessary, add up to 1/2 c. more flour, 1 Tbsp. at a time, to make a slightly sticky dough that forms a ball. Turn dough out onto a lightly floured surface and knead, adding more all-pourpose flour if dough is very sticky, until smooth and elastic but still slightly sticky, about 10 minutes. 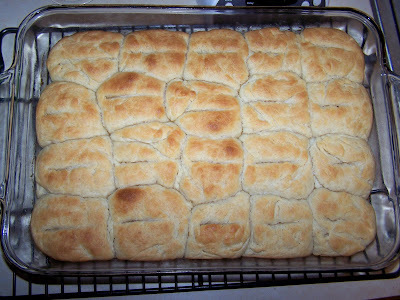 (I used the bread hook in my kitchen-aid stand mixer to knead the dough for me.) Form dough into a ball, put in a buttered large bowl, and turn to coat with butter. Cover with plastic wrap and let rise in a warm draft-free place until doubled in bulk, about 1 hour. Butter a 13-by-9-inch baking pan. Divide dough into 20 equal pieces. Roll each one into a ball and arrange evenly in 4 rows of 5 in baking pan. Cover loosely with plastic wrap and let rise in a warm draft-free place until almost doubled in bulk, about 45 minutes. Using a floured chopstick or edge of a ruler, make a deep crease down center of each row of rolls. 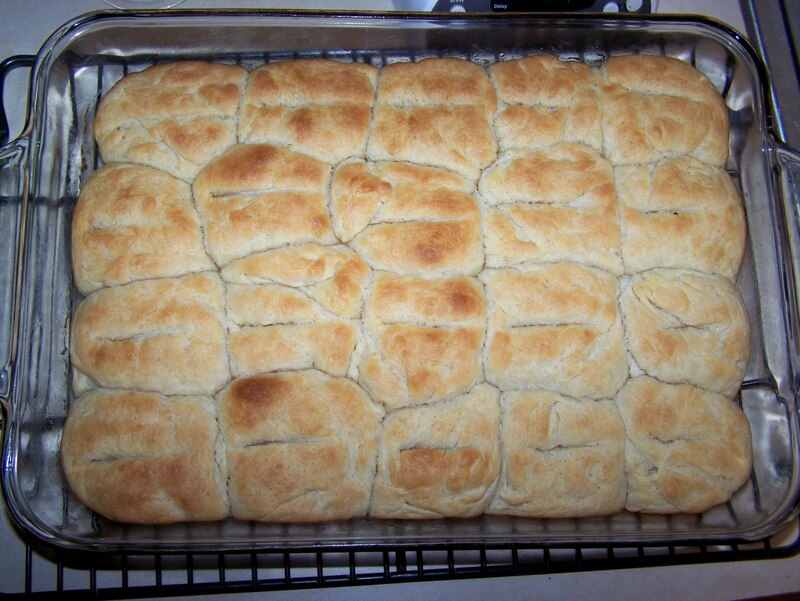 Let rolls rise, loosely covered, for 15 minutes. Put a rack in middle of oven and preheat oven to 375 degrees. Melt remaining 2 Tbsp. butter; cool slightly. Brush tops of rolls with butter and bake until golden, 20-25 minutes, then turn out onto rack and cool, right side up, until warm. 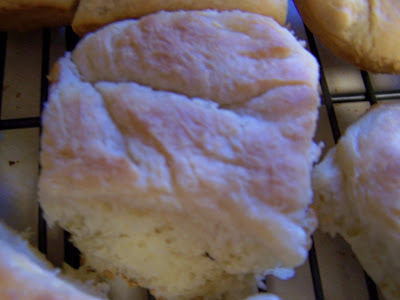 *These rolls can be baked up to one day ahead. Cool completely, then wrap well in foil and keep at room temperature. Reheat in the foil in a 375 degree oven for 15-20 minutes. The cloverleaf shape is easy to form and gives these rolls a showy little fillip. After the dough has doubled in bulk, butter eighteen 1/3 to 1/2 c. muffin cups. Turn the dough out onto a lightly floured surface and divide it into thirds. Work with one portion at a time, keeping the remaining dough covered with plastic wrap. Cut off Tbsp. sized pieces of dough, form into balls, and put 3 balls in each buttered muffin cup. Let rise, loosely covered, in a warm draft-free place until almost doubled in bulk, 30-40 minutes. Preheat the oven to 400 degrees. Brush the rolls lightly with egg wash (1 large egg lightly beaten with 2 tsp. water) and sprinkle with poppy and/or lightly toasted sesame seeds. Bake until golden, 15-20 minutes. Cool as directed above. These rolls were created in the 1870s at the Parker House Hotel in Boston.